A purported video of the incident went viral on the social media. Subsequently, a case was lodged against Kumar at the Sector 39 police station. A student of a private university here has been arrested on attempt to murder charges after he allegedly pointed a pistol at another student of the institute over an old tiff, police said. Surya Kumar (24) was detained yesterday, a day after the incident occurred outside the Amity University in Sector 125, the police said, adding that he was arrested today. Kumar, a resident of Dasna in Ghaziabad, is a final-year B.Com student, while complainant Vivek Yadav, a resident of Safrabad village in Sector 73 here, is a first-year MBA student in the university. According to Yadav, the two had a spat last month over parking of vehicles on the university premises. “Parking inside the campus is not allowed for students. But Kumar was drunk and he got his car inside. I got hit on my leg by his vehicle, so I complained to my teachers. Kumar was scolded and told not to bring his vehicle inside the campus. After that he had warned me of dire consequences,” he claimed. Yadav said on Thursday, he was in his car at the parking lot outside the campus, when he was confronted by Kumar, who was in another vehicle. 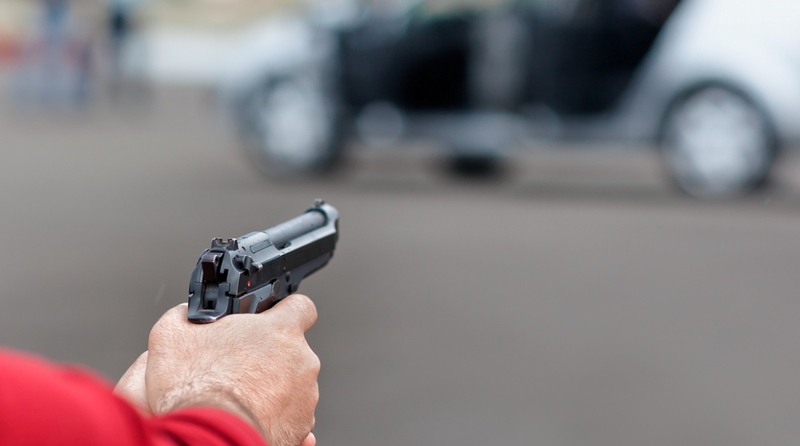 “He came towards my car with a pistol. I quickly rolled up the windows and started the engine. Meanwhile, I also called up the emergency police number for help. “Kumar got on to the bonnet of my car and then latched on to the window, while pointing the pistol at me,” Yadav said. A purported video of the incident went viral on the social media. Subsequently, a case was lodged against Kumar at the Sector 39 police station, officials said. Kumar has been charged under Indian Penal Code sections 307 (attempt to murder), 323 (voluntarily causing hurt) and 506 (criminal intimidation), among others, the police said.